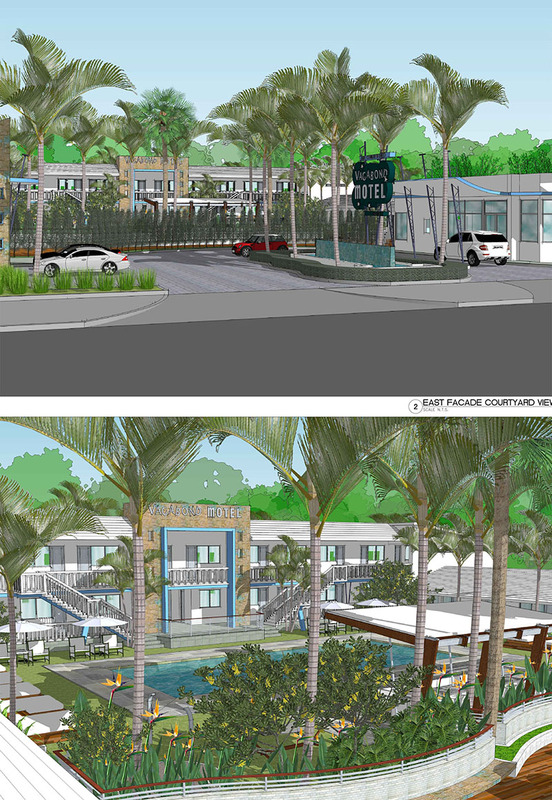 Lewis Aqüi Landscape and Architectural Design (LA2 d) is the designer of the exterior renovation of the iconic Vagabond Motel. This classic motel depicts all the characteristics of the Miami Modern style (MIMO Architecture), including an open-air plan, geometric designs, angular planes, overhanging roof lines and “Eyebrows”, natural stone veneering, and sculptural elements and focal points depicting marine life and other nautical themes typical of the era. The Motel was originally designed in the 1950’sby B. Robert Swartburg who was one of the most prominent and innovative architects in Miami-Dade County. He created other landmark structures as the Miami Civic Center Complex and the Delano Hotel. Lewis Aqüi has recreated the outdoor spaces using the planting palette that is primarily native to South Florida and which was popularly used in the mid-century designs. At the same time Lewis kept in mind a planting design that is “Florida Friendly” which conserves water, protects the environment, adaptable to local conditions and drought tolerant. Construction at the Vagabond Motel on Biscayne Boulevard has just begun, and soon the iconic last midcentury motel will open its doors to the public.